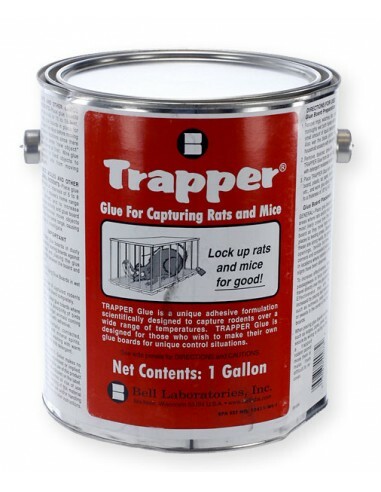 Bell Trapper Glue is a unique adhesive formulation scientifically designed to capture rodents over a wide range of temperatures. 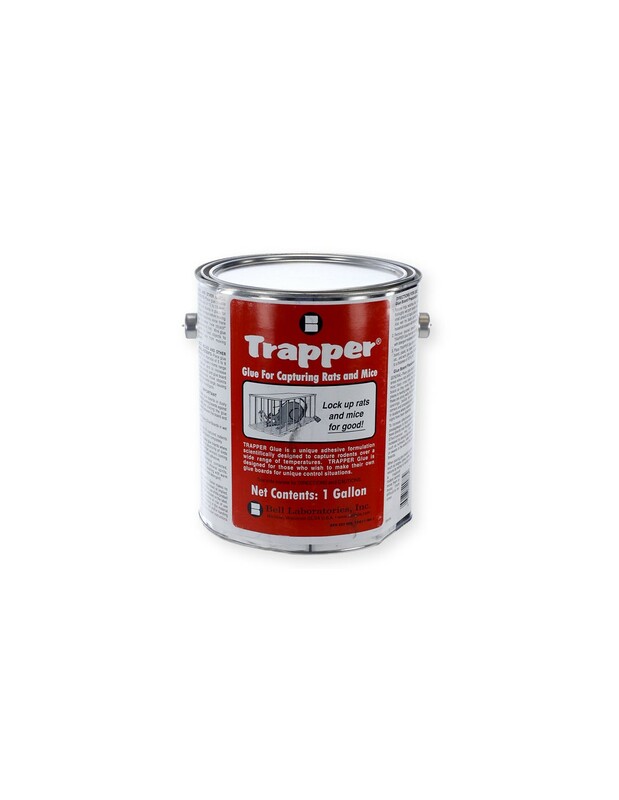 Need a large glue board for snakes, rodents, spiders, flies, swarming termites, wasps, yellow jackets or hornets' Make a glue board as large as you want or as many as you need with Bell Trapper Glue ! LOCK UP THOSE RATS AND MICE FOR GOOD! Simple to use and apply. Scoop glue out of container onto a large box lid, cardboard box or whatever you want to make a glue trap out of and spread evenly. Use a spatula or some other flat tool for best results. Lipped box containers make great glue traps and will not allow glue to run off. Flat boxes work great, but be careful not to allow glue to run. Glue can be removed with mineral spirits, vegetable oil or pam. Care should be given when making glue traps. We recommend to cover all indoor glue traps with a cover such as the Bell Tunnel or folding the glue trap in such a way as to prevent trapping of birds and non-target organisms. GLUE BOARD PLACEMENT: General - Place glue boards in areas where rats and/or mice will most likely cross over the glue board as they move from hiding places to feeding araeas. Generally, these are along walls, by gnawed openings, beside burrows, in corners and concealed places, or in locations where rodents or their signs have been observed. To increase the effectiveness, block passageways to force rodents to passageways to force rodents to travel directly over the glue boards. Effectiveness may also be increased by placing bait materials such as nutmeats, cake crumbs or sweets in the center of the glue boards. When placing glue boards on sites such as ledges, pipes, poles, etc., secure by wiring or nailing so that a trapped rodent cannot move them or make them difficult to recover. * Protect glue boards in dusty areas by leaning boards against a wall and placing the glue boards between the board and wall. * Avoid using Glue Boards in wet areas. * Dispose of captured rodents and glue board completely. * Do not place glue boards where there is a possibility of birds or non-target animals coming in contact with adhesive. * If accidentally contacted, remove with mineral spirits, vegetable oil or pam. Follow by washing with warm water and mild detergent. Bell Trapper Glue Manufacturer: Bell Laboratories, Inc.